Neil Gaiman was born in Portchester in Hampshire and grew up in West Sussex, raised in both the Jewish faith and in the Church of Scientology (while parts of his family are still involved with the Church of Scientology, Neil has said he is not a Scientologist). He discovered his love for books at an early age, alphabetized all the books on his bookshelf, and has described himself as a “feral child who was raised in libraries”. Journalism, a vocation he chose for the purpose of learning the publishing business from inside, was his ticket to a writing career. His first two published novels were biographies, on Duran Duran and Douglas Adams. The path to his current career in more fantastical fiction began with writing comics – a result of his admiration of and friendship with the legendary Alan Moore – and after writing Black Orchid for DC Comics he was asked to do his own take on the their old character The Sandman. The rest is history. It was a huge success, spreading far beyond the regular reach of a graphic novel, altering the playing field for graphic novels for ever. Since then he has written several novels, short stories, and children’s books (he has reportedly said “I think I will always write children’s books. I love warping young minds.”) His works have turned him into a celebrity with something of a cult following, and he is certainly one of the most visible authors around – not only at book signings and talks but online as well, being a prolific blogger and tweeter who despite his fame and busy schedule manages to keep a surprisingly personal connection with his fans. My first contact with Gaiman’s works was in the mid 90s, with The Sandman and my all-time favorite Death: The High Cost of Living. I was absolutely delighted with the way he drew inspiration from myth, religion and legend and wove it into a complex mythology of his own. I began hunting down more of his work, and it wasn’t long until I stumbled upon the novelization of Neverwhere. The idea of a society within society, solely occupied by outcasts and beings of myth, held great appeal for me. 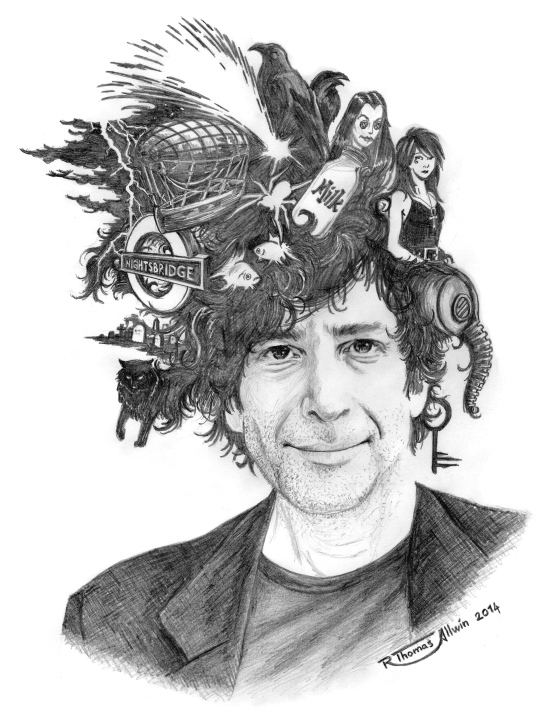 Ever since I was a child I have felt somewhat detached from normal life, and have always been drawn to stories with that concept of finding a secret world within the world – a recurring theme Neil Gaiman’s works. His characters often find themselves out of their depth, drawn into a world they had no idea existed; a world where the rules they have learned doesn’t quite apply anymore. He is a master at taking the mundane and everyday and give it a twist into the fantastical. American Gods and Stardust are other great examples of this, as are many of his short stories. Gaiman’s works are an inspiration to me in many ways. He was the first to really show me that it is not only possible, but desirable, to combine myth and classic literature with modern ideas and present it in ways that are more accessible to the younger readers of today. Often, the stories he writes conjure up vivid images and concepts in my imagination completely unrelated to what I’m reading – often a simple, insignificant detail in his work triggers something in my mind that turns into a story seed. Lastly, he himself is an inspiration: Neil is a great example of someone who went their own way and transcended the ‘rules’ of publishing and genre fiction. I admire the way is able to span several niches in the field of literature, successfully jumping between young adult fiction, genre fiction, children’s books, comics and even television, film and radio. His commencement speech at the University of Arts class of 2012 is absolutely brilliant and very inspiring – I watch it whenever I find myself in a creative slump. Oh, and I almost forgot – he has extra pockets in his jackets and coats. Just so you know. Cool. so many things when you look closer. without making it too cluttered. Indeed he is! If you haven’t already, you might want to check out Neil’s ‘Don’t Panic: The official Hitchhiker’s Guide to the Galaxy companion’ or one of the later editions with added material from other authors. Love Gaiman too! Not so popular in India, surprisingly…considering his use and love of myth. Will track down Neverwhere too. He really does have a fantastic head of hair. Great portrait, nice little rundown of his life. Good job! Thanks – the hair was certainly a big part of my inspiration! One of my favorite writers, well done! I’d only heard of two of Gaiman’s books before, “Stardust” and the children’s novel “The Graveyard Book”, both of which I’ve read and loved – I’ll look into his others! You might want to specifically look for “Coraline”, “Neverwhere” and “Ocean at the End of the Lane” for starters – “American Gods” and “Anansi Boys” are a bit darker in tone and might be quite a jump to make from “Stardust” and “Graveyard Book”. If you are into comics at all I can highly recommend “The Sandman”-series and the two spin-offs about Dream’s sister Death! Thank you! Wow, those photos are neat – I’ll have to take a closer look at Van Livet!